NEW YORK (AP) — Stocks fell further on Wall Street Monday as Turkey’s central bank was unable to stop a steep plunge in that nation’s currency. That’s helping to push the dollar higher, which hurts big U.S. exporters. Stocks were coming off their worst losses in a month as investors worried about financial and economic upheaval in Turkey and the possibility it will spread to other countries. Asian markets fell overnight, while European markets were slightly lower. Global markets skidded Friday as investors worried that financial distress in Turkey could affect the international banking system and the broader economy. Many analysts say that isn’t likely, but it’s caused sharp losses for stocks. On Monday Turkey’s central bank announced measures to help that country’s banks, but the Turkish lira and Turkey’s stock market continued to slide. The lira has been tumbling as investors question whether the government of President Recep Tayyip Erdogan can cope with problems including the weakening currency and a diplomatic spat with Washington that has resulted in higher U.S. tariffs. Erdogan has ruled out the possibility of higher interest rates, which can slow economic growth, but independent analysts say higher rates are urgently needed to stabilize the country’s currency. Erdogan’s refusal is one of several factors worrying investors. Investors also backed away from Argentina’s stock market. The Argentinian peso sank to an all-time low amid investor caution and a local corruption scandal involving former government officials. While Turkey and Argentina face very different political situations, the currencies of both countries have tumbled to all-time lows against the dollar, partly because rising interest rates in the U.S. lure investors to take money out of their markets and move it to the U.S. The U.S. dollar is the strongest it’s been in more than a year, which could eventually create problems for U.S. companies that make a lot of sales overseas. Terry Sandven, chief equity strategist at U.S. Bank Wealth Management, said the dollar has strengthened because economic growth has picked up and other regions aren’t doing as well. “The U.S. is a relative beacon of strength with stable to improving economy. That suggests a stronger dollar,” he said. The S&P 500 index lost 11.35 points, or 0.4 percent, to 2,821.93 after a drop of 0.7 percent Friday. 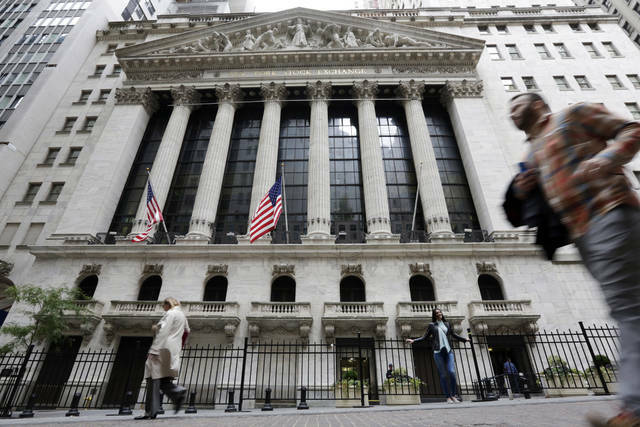 The Dow Jones Industrial Average slid 125.44 points, or 0.5 percent, to 25,187.70. Energy and industrial companies and basic materials companies took some of the worst losses. Technology companies held up better. The Nasdaq composite fell 19.40 points, or 0.2 percent, to 7,819.71. The Russell 2000 index of smaller-company stocks sank 11.49 points, or 0.7 percent, to 1,675.32. Investors are worried about a confluence of factors including Turkey’s reliance on foreign loans, which become more difficult to repay when the country’s currency is plunging. Also, a diplomatic spat with the U.S. is resulting in sharply higher tariffs on Turkish steel and aluminum. After a yearlong stretch where much of the global economy was speeding up together and stocks were rising, the recent losses for Turkey and Argentina have caused emerging market indexes to fall out of favor. Stocks were on a five-week winning streak before last week, and strong corporate earnings reports were a big factor. But most of those reports are done, and Sandven, of U.S. Bank, said stocks may spend the next two months wavering. In corporate news, German conglomerate Bayer took a dive after a U.S. jury ruled against its Monsanto unit Friday and awarded $289 million to a former school groundskeeper who said that exposure to Monsanto’s Roundup weed killer caused cancer. Monsanto said government agencies and hundreds of studies have concluded Roundup is safe. Trading in Germany, Bayer tumbled 10.3 percent. Motorcycle maker Harley-Davidson fell 4.3 percent to $41.38 after President Donald Trump tweeted in support of a potential boycott of its products. Trump has been criticizing the company since June, when it said it would move more manufacturing out of the U.S. to avoid European tariffs. The EU put new taxes on U.S. motorcycles in response to the Trump administration’s tariffs on products imported from Europe. U.S. crude oil fell 0.6 percent to $67.20 a barrel in New York. Brent crude lost 0.3 percent to $72.61 a barrel in London. Nielsen Holdings jumped 12.1 percent to $24.62 after Elliott Management, a firm run by activist investor Paul Singer, disclosed an ownership stake and said Nielsen should consider selling itself or some of its assets to boost its stock price. Nielsen stock has been sinking since it traded over $50 two years ago. Most retailers were down, but Amazon advanced 0.5 percent to $1,896.20. It passed travel website Booking Holdings to become the highest-priced stock on the S&P 500. In other energy trading, wholesale gasoline dipped 1.2 percent to $2.01 a gallon. Heating oil lost 0.1 percent to $2.14 a gallon. Natural gas slid 0.5 percent to $2.93 per 1,000 cubic feet. Gold dropped 1.6 percent to $1,198.90 an ounce, its lowest price since January 2017. Silver fell 2 percent to $14.98 an ounce. Copper dipped 0.4 percent to $2.73 a pound. Germany’s DAX declined 0.5 percent and London’s FTSE 100 retreated 0.3 percent. France’s CAC 40 fell less than 0.1 percent. Tokyo’s Nikkei 225 lost 2 percent and Hong Kong’s Hang Seng retreated 1.5 percent. The dollar rose to 110.69 yen from 110.64 yen. The euro dipped to $1.1394 from $1.1398.